The USNS Amelia Earhart, T-AKE 6, sailed by Monday morning on her way to Masan, Korea. 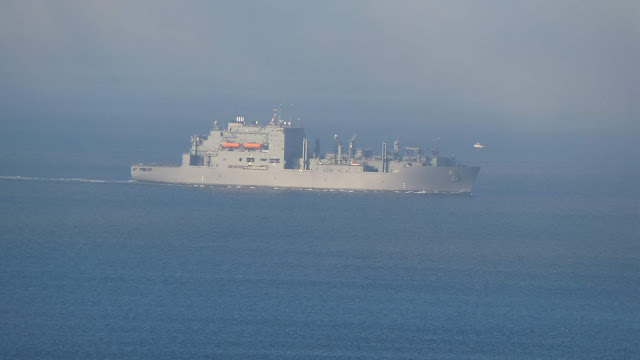 The ship shone in the sun, then slipped into the bank of fog. Camouflage on the sea was demonstrated, and Amelia disappeared. This vessel has her own coat of arms honoring the woman for whom she was named. Gold represents achievement, excellence and high ideals, Celeste Blue symbolizes the skies over the Atlantic, the Pacific and the United States, through which Amelia Earhart made her historic flights. The demi-globe recalls her goal to circumnavigate the Earth. The lozenge, a symbol traditionally associated with women, represents Earhart, her achievements in aviation and her importance to the wider acceptance of women’s abilities and roles in twentieth century culture. Argent (White) denotes purpose and integrity. The aircraft represented in base, an Electra, is the type she piloted during her final record-breaking attempt. The compass rose refers to navigation, by sea or by air. The award to Amelia Earhart of the Distinguished Flying Cross, given at the time to only three civilian recipients, is signified by the propeller, derived from the award. Azure represents flight. 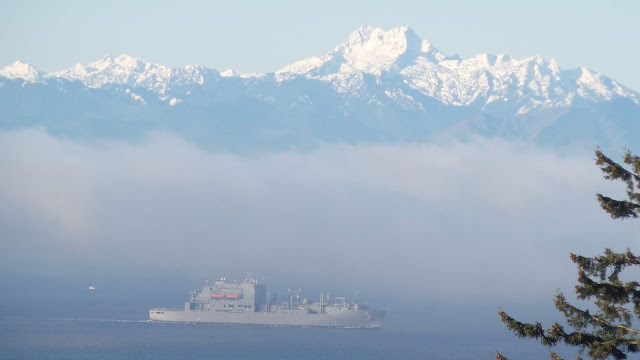 The ship went into a fog bank but the Olympics maintained their proper place in the sun.